Sherry Siems (left) and Silvest Morris (right) are among the volunteers who will shave their heads to raise funds for pediatric cancer research. 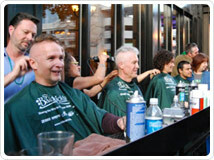 UC Davis Cancer Center has established a shave team for this year’s St. Baldrick’s event to raise funds for childhood cancer research set for Monday, March 14 starting at 5 p.m. at deVere’s Irish Pub in Midtown, Sacramento. Among the hundreds of participants will be Sherry Siems, a 13-year — and long-locked — employee of the Cancer Center’s second floor oncology clinic, Silvest Morris, who works in the center’s information technology group, and Ralph deVere White, cancer center director, who will be returning from a trip to Europe just in time for the annual haircut. The event is hosted by the Keaton Raphael Memorial, a foundation based in Roseville that supports children with cancer and their families and funds research toward a cure. Over the past nine years, the foundation has raised more than $2 million from the St. Baldrick’s events in Sacramento and in Roseville. In addition to showing solidarity with children undergoing chemotherapy and other kinds of cancer treatment, shavees also collect donations from friends, family and others, which are distributed to pediatric cancer researchers, including at UC Davis Cancer Center. 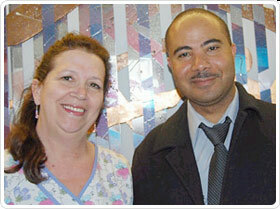 In 2010, participants in the event at deVere’s raised nearly $90,000, almost $15,000 more than the initial goal of $75,000. All told, 210 people had their heads shaved, including 60 women. Henry deVere White, co-owner of the pub and the son of Ralph deVere White, said the pub is aiming to raise $150,000 this year, a tall order with just more than two weeks to go. The pub owner said this year’s event includes a large beer garden along the sidewalk in front of the restaurant, with all profits going toward the cause. The event will be followed by live entertainment. Established in 2000, the St. Baldrick’s Foundation is considered the world’s largest volunteer-driven fundraising program for childhood cancer research. More than 147,000 volunteers have shaved throughout the country, raising more than $90 million.